Some of the dips at the south end of the trail that turn into large puddles after heavy rain have been filled in with some kind of aggregate. While it’s good to see the Billy Trail finally getting some – long overdue – attention, the new surface is unsuitable for all but the most hardy cyclists. I tried it with a full-suspension mountain bike with wide tyres and – even so – my wheels were skittering and it was hard to keep control of the bike. People that are not expecting the new surface could easily come off their bikes and injure themselves on the hard uneven surface. This picture shows the new surface close up. 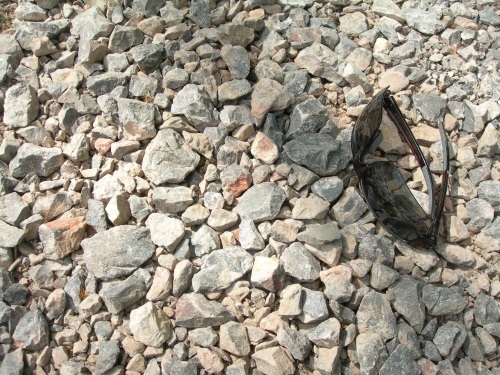 I’ve included my glasses in the shot to give some idea of scale. It’s hard to see this work as an improvement for any of the users of the Billy Trail. We are trying to find out who is behind the work so we can raise our concerns and – hopefully – work towards a fully accessible Billy Trail. For the time being, however, this looks like a backward step. 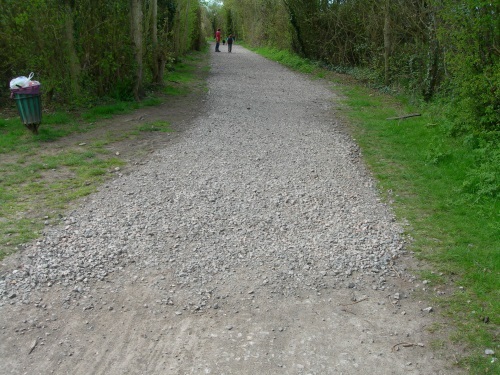 As regular users of the Billy Trail ( I first travelled it on my mother’s arms in the Puffing Billy around 1944) my wife and I thought how perfect an example of non-thinking by the relevant department was the use of such big stones as infill in the recent ‘re-surfacing’ work. Looking at this and other examples of work done locally perhaps with the best intentions towards cyclists, it seems that Havant needs a Cycling Tsar. That would give a focal point to all matters of concern to cyclists occurring on the Island. The Tsar would be copied in to any notices of intent concerning works to be done, and he or she could gently point out (in this case literally) a better way when necessary. He/she would also be a roving ambassador for Hayling and demonstrate the Island’s commitment to a more ecologically sound bike-friendly future. Generally, the Hayling Bike Tsar would also be a point of communication and reference for all things bikey on the Island. The appointment would also give a raised profile and further status to ongoing projects by CH. Perhaps more importantly, the idea of having the first Cycling Tsar in the county/country(? )would appeal to the Council and might even attract a small stipend to cover expenses. Perhaps. I’m sure we could find a suitable Hayling candidate. But, if Havant/Hampshire could be convinced of the need for a cycling czar, I’m sure they’d want that person to represent Havant/Hampshire – which would be a much more demanding and difficult job!